The Optoma HD29Darbee includes some unusually sophisticated features for a $649 entry-level home theater projector, most notably a DarbeeVision Image Processor and support for ISF day and night modes. The processor is designed to enhance detail, depth, lighting, and object separation (using sharpening and noise reduction), with menu options that let you set the feature to taste. There's even a split-screen demo mode so you can see a processed half of the image side by side with an unprocessed half. Even without paying for ISF calibration, it is easy to adjust the HD29Darbee to give neutral color. And like many Optoma models it has the advantage of showing almost no rainbow artifacts. It also stands up well to the competition on brightness. For a 1.3-gain screen, it is bright enough using our video optimized settings for a 150" 16:9 image in a dark room or a 95" image with moderate ambient light. One of the top two in the round up for contrast and three-dimensionality. 70% brightness uniformity -- higher than all other DLP models in this round up, which are 60% or lower. Low Lamp Mode. Eco mode is 81% as bright as Bright mode. Video Optimized Lumens. For film and video, Cinema mode with some slight adjustments delivers well-balanced, natural-looking color, although the closest I could get it to matching a reference projector was still a tad oversaturated in a side-by-side comparison. The 846 ANSI lumens is sufficient to light up a 150", 1.3-gain screen in a dark room. In moderate ambient light you'd want to keep it to about 95". With a 1.0 gain screen you could still go up to about 130" image in a dark room. Video Performance. Like all the Optoma models in this sub-$700 roundup, Cinema and Reference modes deliver very watchable, pleasing, natural-looking color even with default settings. They also offer the best contrast and image depth for any of the Optoma projectors and a close second for the entire group. For higher ambient light or a larger screen size, both Game and Vivid modes are good enough for casual use for a backyard movie night or daytime in a family room. Color accuracy in these modes is within a realistic range, although close-ups of faces look a bit two-dimensional from loss of subtle shading. Bright mode is potentially usable as well, with only a minor green bias in many scenes. However, flesh tones in facial close-ups will manifest some green tint and look more two-dimensional. So this mode may be viable for occasional football parties in high ambient light, but it is not what you'd use for regular theater viewing. Zoom Lens Effect on Brightness. The 1.1x zoom is too short to create any loss of light to worry about--there is no "telephoto" end to speak of. Brightness Uniformity. The HD29Darbee's brightness uniformity is 70%, a level of variation that's hard to see--there are not hotspots or obvious fading. This measurement of 70% is better than all other DLP projectors in this sub-$700 category which measure 60% or lower. Only the 3LCD-based Epson Home Cinema 1060 at 79% exceeds the HD29Darbee in uniformity. Image Sharpness. Our test sample did not focus perfectly across the entire screen but the error was minor. With most of the image in sharp focus it tends to be a bit soft along one side, but only about 5% of the image width. It would be rare for anyone to notice this as the eye almost never focuses on the extreme edges of the picture, and the degree of softness is subtle. Input Lag. 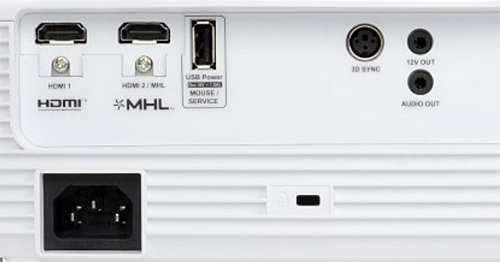 In most color modes the HD29Darbee's input lag is 33 to 34 ms with default settings. However, with Enhanced Gaming turned On, it drops to 16.5 to 17.4 ms.
On-board audio. The 10-watt mono speaker delivers high enough volume for a small family room, but it is not one of the better projectors in the group where audio is concerned. You'll want to use an external sound system. The audio quality is best described as usable, but tinny, with a tendency to overmodulate at the highest volume settings. Fan noise. Optoma has been doing a great job with fan noise lately. The HD29Darbee offers the least intrusive fan noise in this group of sub-$700 1080p projectors. 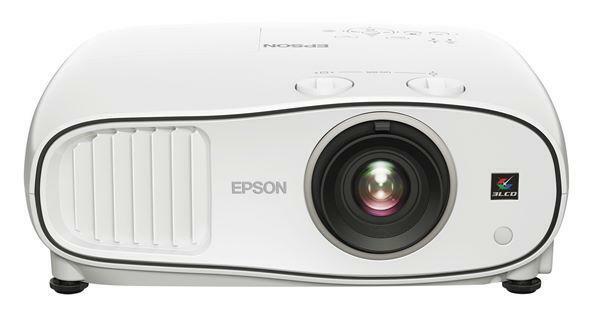 The new Optoma 4K projectors are similarly quieter than their respective competitors. Sound quality in both Bright and Eco modes on the HD29Darbee is low enough that most people won't notice it in a family room with ambient noise during quiet moments in a movie. In Eco mode, you have to be sitting right next to the projector to hear it even in a quiet room. In High Altitude mode, fan noise in Bright mode is loud enough to be potentially intrusive in quiet moments in any room, but it is still quieter than any of the competition. In Eco mode, its no more intrusive than in Bright with High Altitude mode off. Throw distance. The throw distance for a 120" 16:9 diagonal image with the 1.1x zoom lens ranges from about 12.9 to 14.1 feet. You can find the throw distance range for the image size you want by using the Optoma HD29Darbee Projection Calculator. Lens offset. The HD29Darbee's lens offset is designed for either mounting upside down in a ceiling mount or placing on a table or bookshelf behind the seating area. With the HD29Darbee sitting on a flat surface, the entire image is above the centerline of the lens, with the bottom of the image 10% of the image height above the center line. You'll want to avoid placing it on a high shelf, tilting it down, and using keystone correction, which tends to add artifacts to fine patterns in the image. With its DarbeeVision Image Processor, Full HD 3D, 16.5 ms input lag, quiet fan noise, above average uniformity for its price class, and support for ISF Day and Night modes, the Optoma HD29Darbee delivers a lot for its $649 price. Even if you don't want to pay extra for ISF calibration or tweak settings yourself, Cinema mode delivers natural-looking color for film and video. Viewed side by side with the image from a reference projector, you can see the color is a touch oversaturated, but few people will notice that without a comparison, and many people prefer slightly oversaturated color. In any case the HD29Darbee's color is well within the realm of realistic. For gaming, the HD29Darbee offers a 16.5 ms input lag which is the fastest of any projectors on the market that we know of. For 3D, it supports DLP-Link and VESA RF glasses, and unlike some projectors, it will let you customize 3D mode image settings. Even better, it offers somewhat better than average brightness for its 3D compared to 2D, and we didn't see any crosstalk or 3D-related motion artifacts. With 2D film and video, the HD29Darbee measured 846 ANSI lumens with its video optimized settings. That's bright enough with a 1.3 gain screen for a 150" 16:9 image in a dark room or a 95" image with moderate ambient light. 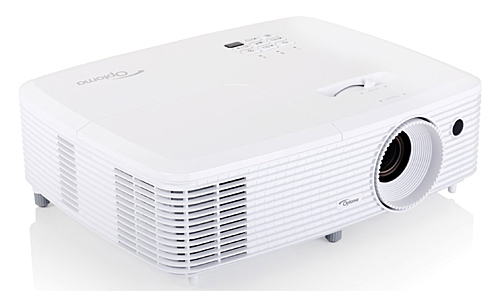 Though it can be used in ambient light, in order to get the full benefit of its contrast and optimum video settings, use this projector in a dark viewing room that replicates the experience of a commercial movie theater. The Optoma HD29Darbee delivers much better brightness uniformity than most of its entry-level competition, it is one of the two best for contrast and three dimensionality, it has low fan noise, and it shows almost no rainbow artifacts. This combination of strengths makes it a solid choice for classic home theater or a family-room TV substitute, and one of our top choices for 3D.